In recent years, thanks to the popularity of the Nissan Qashqai, we have seen a glut of medium sized SUV’s enter the car buying market. Also, thanks to Nissan with the success of the Juke, mini-SUV’s have also become popular, with a glut of launches in this sector, including the Renault Captur, Fiat 500X, Seat Arona, VW T-Roc, Toyota CH-R & Honda HR-V. Also launched into this sector in late 2015, was Mazdas version the CX-3 which arrived at CCV Towers recently. The CX-3 is heavily based on the more practical but less attractive Mazda2, with similar front-end styling to the 2 including a deep, shield-shaped grille that follows the current Mazda Kodo design treatment. With narrow headlamps that wrap around on to the front wings & sleek rear windows, the CX-3 really looks the part & it is undoubtedly a more attractive car to look at than the bulldog looking class leading Juke, with angled fog lights giving the compact crossover a sporty look. At the back, the tail-lights have the same effect. They’re shallow and wide, sitting across the rear wings & hatchback. Above them is the black C-pillar, which helps make the Mazda look lower to the ground than some of it’s competitors. Talking of which, there’s lots of black plastic body cladding around the wheel arches & door sills which are designed both to give the car a rugged appearance & to protect the bodywork from minor scrapes. As well as this, all models get alloy wheels, body coloured bumpers & a tailgate spoiler as standard, further enhancing it’s features. The cabin gets the same dashboard as in the Mazda2. There’s one small rectangular air vent & three circular ones, plus the climate control dials & a 7” touchscreen in front of you. The touchscreen display can also be controlled with a rotary dial on the centre console, similar to those found in BMW & Lexus models. Getting comfortable is also easy, with a range of adjustment for the front seats & for the steering wheel. The interior is well put together & is made on the whole of quality plastics. It’s clear that Mazda have tried to give the CX-3 a premium feel with the addition of soft touch plastics, stitched coverings for the instrument binnacle & seating. Standard kit only enhances this appeal, with Bluetooth, cruise control, air-con & electric folding mirrors all included. All models also get a DAB radio as part of the 7″ touchscreen infotainment system. SE-L models add climate control & heated seats , while the range-topping Sport Nav benefits from sat-nav, keyless entry & a BOSE stereo, although the Bose does eat up some of the boot space with it’s sub-woofer. Mazda have also worked hard to make the CX-3 safe, with all models getting six airbags, stability control & tyre pressure monitoring. The SE-L benefits from the addition of lane departure warning & autonomous emergency braking, while the Sport Nav adds a heads-up display, a reversing camera, LED headlamps. If you want 4WD, it’s only available on top of the range Sport Nav trim. In the front, the cabin feels spacious, but it is a little claustrophobic in the back. Taller passengers will have height issues. I sat in the back & at 5ft 8″ my head was almost brushing the roof. Having said that, the CX-3’s external dimensions are slightly larger than those of the Nissan Juke, so there’s actually more room inside, but, thanks to the sigher roof line, not as much as in the Mazda2 on which it is based. For storage, there’s a decent sized glovebox, two very good door pockets & a couple of cup holders in the centre binnacle. The boot has a high load lip, but it’s double-layered floor makes it relatively easy to get your stuff in out without too much fuss. The floor can also be raised when the 60/40 split rear seat is folded, increasing the boot space from 287 litres to 1197 litres when required. 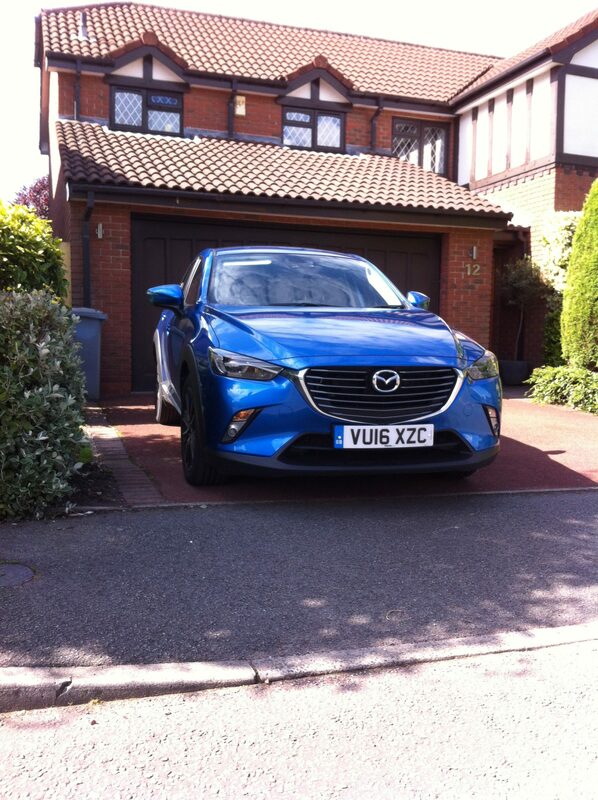 Mazda loaned Company Car the CX-3 1.5 105ps 2WD Sport Nav Diesel manual version of the CX-3. With a top speed of 110 mph & a 0-62mph time of 10.1 seconds, the 105ps unit was actually good fun to drive & surprisingly quiet from start up compared to the usual diesel noise I was expecting. Combined fuel consumption was a claimed 70.6mpg, whilst I actually averaged 51.7 mpg, so as in most cases the claimed economy is around 20 mpg higher than I ever manage to achieve in a real world test. None the less, achieving over 50mpg is to be applauded & with CO2 emissions of 105g/km, the CX-3 makes aan attractive proposition for company car drivers. Like all Mazdas, SKYACTIV technology is at work here – Mazda’s commitment to reducing the weight of all its cars – which helps to improve both fuel economy & whilst not reducing the cars performance. The CX-3 like all Mazdas is a drivers car. Light precise steering coupled with a smooth 6-speed gearbox make for fun motoring in town, whilst on the motorway the addition of cruise control enabled me to relax on a longish journey to Birmingham & back through miles of 50 mph speed limits. My fuel economy was good & the needle on the fuel gauge did seem to take forever to go down, which has to be a good thing & another feather in the diesels cap. What about the petrol CX3 ? As luck would have it I got to try the petrol CX3 at a Mazda driving day in Yorkshire & I have to say that it felt gutless compared to the diesel. It’s quicker & reaches a higher top speed but the lack of pull at low revs is very noticeable. I averaged 41.2mpg on my one hour test route along mainly B roads, so, despite the governments illogical views on diesel, diesel will offer better economy. Any negatives ? Although it’s well equipped, well made & good looking, the entry-level model costs around £17,500 which is more than the cheapest Juke & although the CX-3 is a better car than the Juke, this could be a stumbling block for some. The standard price of my test car was £21,895, but that is for the top of the range model with all the goodies included.